An unlikely, for Florida brown, Tudor-style fairy tale dwelling, Lichgate Cottage, sits snug by a big brown tree in North Florida. This is the hand-built haven of author & classics professor at Florida State University, Laura Jepsen, who died in 1995. Miss Jepsen bought undeveloped land because of a single tree she couldn’t get out of her mind, once she had climbed over a barbed wire fence to get a close look at it. It became her dream to save it & live near it. She scraped up the money to create hand-built, artisan-carted cottage on the land, so she could watch over the tree. 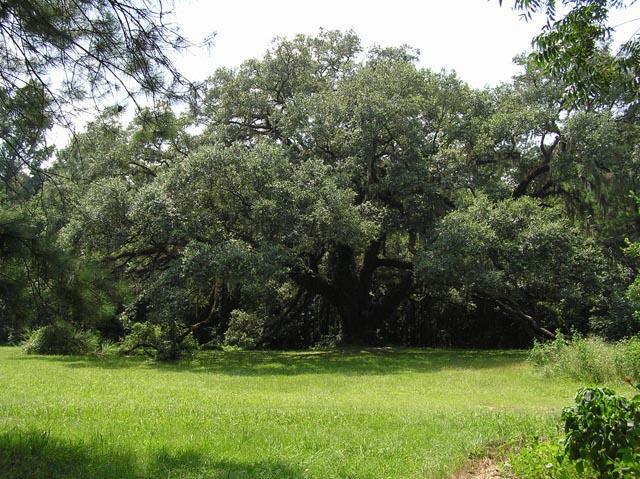 This majestic oak with boughs that bow down to the ground is listed on a national tree register & is the subject of a landscape portrait by a noted tree artist. It is also detailed in the out-of-print history, LICHGATE ON HIGH ROAD, created by Laura Jepsen. Volunteers who interpreted & preserved the Lichgate Cottage & the Lichgate Oak, created The Laura Jepsen Institute. They celebrate the life of Laura Pauline Jepsen. to create an outdoor room. A visit from Atlas Obscura to Lichgate. Lichgate offers, tucked away in a quiet corner, a series of circles to walk in contemplation.